If your dog suffers from separation anxiety or other environmental stressors, we've got a great, and FREE, sampling opportunity for you today! 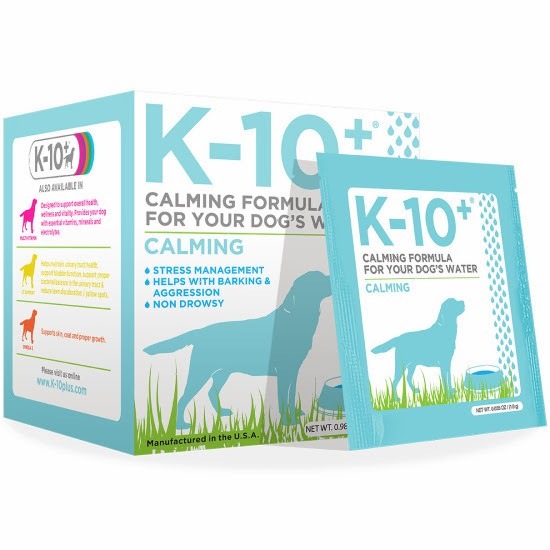 K-10+ has come out with a new water soluble calming formula, and they are offering our readers a full 28-packet box for you to try with your dog. Simply fill out this form with your contact information and the first 100 to sign up will receive a box of K-10+ Calming Formula absolutely free! In return, the folks at K-10+ would love to hear about your pup's experience using the product. And because you'll receive about a month's supply of K-10+, you should be able to give it a good try to help with your pup's anxieties. The deadline for signing up for a free box is January 22 so don't delay! And, to make the deal event sweeter, the nice folks at K-10+ want to thank you for your product review by providing you with the chance to win a $50 Petco gift card! After giving the product a good try, simply write a few sentences about your pup's experience (see details below how to post your review). K-10+ comes in pre-measured packets and it dissolves easily in water, making it super easy and stress free for both you and your dog! It has no additives, flavors, artificial coloring, preservatives or fillers and won't cause drowsiness. You can learn more about K-10+ Calming Formula on the K-10+ website or visit them on Facebook or Twitter. The full line of K-10+ supplements is available at Petco, including Multi-Vitamin, Glucosamine, Omega 3, Calming, UT Support and Senior Care formulas. Not only do the folks at K-10+ have a line of helpful products, but we also love their sense of humor. Check out this fun commercial they shot recently. I'm planning to teach Rocco to do this, Better hide my credit card! The first 100 to sign up via the form above will receive a free sample box of K-10+ Calming Formula for dogs. After trying the product, post a review on the Petco website and you'll be entered for a chance to win a $50 gift card from Petco. This free product offer runs through January 22; this offer will end when our maximum of 100 boxes is met. Reviews must be posted by February 28 to be eligible for the gift card drawing. Visit the Petco website page for the K-10+ Calming Formula by clicking this link. Click the "Write a Review" link to the right of the product image. Sign into your Petco account or Create an Account by filling in your email address, name, and a password. On the review page, you'll be prompted to use a Nickname, rather than leaving your actual first and last name. K-10+ urges you to leave an honest account of your experience with their product, and thanks you for taking the time to share your thoughts. Good luck in the drawing! This outreach is a service of the Event Barkers social media promotion group. You'll find the same offer posted at DogTipper and All Things Dog Blog; however, you may only receive 1 free box of K-10+. Disclosure: Event Barkers is offering this sampling opportunity as a service to K-10+. We have received no free product, but have been compensated to run this offer on their behalf. We tried some of the ones available over here in the past and they never worked for us but hope those are good. Have a marvellous Monday. I've really been wanting to try something for my deaf hound girl, Ran (pronounced "Raan", almost like the boy's name Ron - it's a Japanese girls' name meaning orchid). She's the first dog I've ever had who had separation anxiety, and while she's gotten a little better since I adopted her nearly four years ago, she still gets very stressed when I have to leave the house. She's chewed through one crate and has been working on a second one (much sturdier, so I think she's given up on getting out of it that way). I hate knowing that she is so stressed when I leave the house, but I can't always take her with me and I can't be home 24/7. I really hope I get this sample! Thanks for sharing. Thanks for sharing this! My two rescued boys both demonstrate a bit of anxiety at times. Nursing homes are often described in relationship to the seniors and those with psychological and actual issues, who may not be able to operate effectively out in the world. Many individuals have a damaging concept when they think about these features but the truth of it is that these locations can be a sanctuary for those who cannot deal with their issues alone, as well as the family associates of the sufferers.